EarthWise ice-enhanced chiller systems operate at night to make ice when utility rates are lower, then store the ice for use during the day. 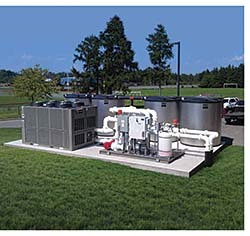 Ice systems consume no water and have no cooling tower maintenance needs. Chiller has a BACnet system controller with preprogrammed sequences, system scheduling, and six operating modes, including chiller only, ice only, or make ice and cool. System also offers optional heat exchanger sequencing and control and pump control for water loops.